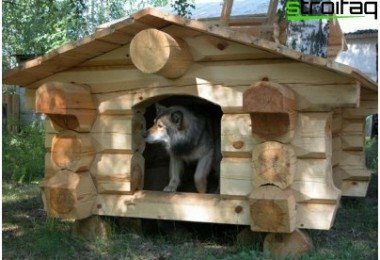 Build a garden house with his own hands is not sodifficult as it seems at first glance. Of course, I have a little work, but such work will bring only pleasure. 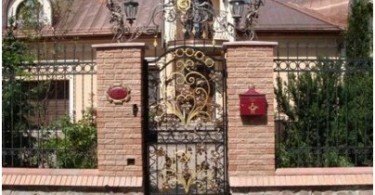 After a short period of time you will be able to move into their own housing, and do not need for years to save money for this dorogushchy and a huge stone house. 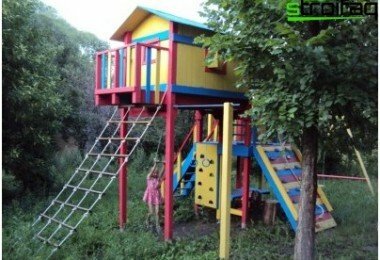 Although sturdy and warm cottage - under the open sky deal right, but wait for its erection is not very convenient. 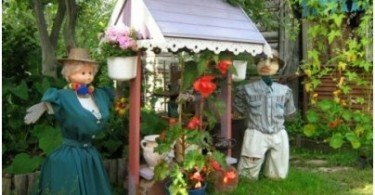 Comfortable shelter will allow safely engage in the construction, at the same time growing vegetables in the garden and flower beds. Before you begin construction, you need toto determine the size of the house and the functions it will perform. Calculate all the details you need: how many rooms to build, what the ceiling height, as you can accommodate guests in the house and what materials it is better to use buildings. 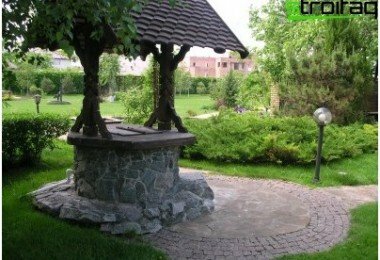 Elaborate designs of garden housescan save a lot of time and money, so do not be lazy to paint everything on paper by millimeters. First, draw the layout plan of the house foundations - its foundation. 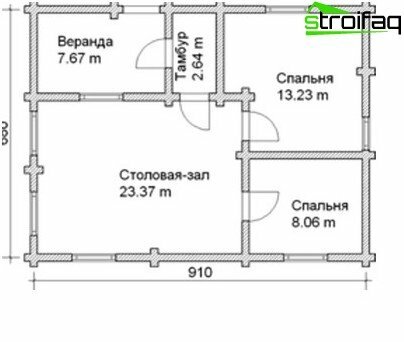 Calculate all the structural units, where the walls are mated floor, ceiling, floor and roof supports. An important point of the project has a list of communications - water, electricity and gas supply. That's all you need to paint a schematic indicating a place of connection to the mains. When choosing a site for the construction of necessarytake into account that the garden houses of economy class is not desirable to have in the lowlands, where the often collects water after rain. It is best to select the highest point in the area and thus avoid future moisture indoors. The optimal location for the house - is the northern or north-west side of the site. That place plot not obscure, and this is very important, it is better not to plan it near the border and back down three or four meters. 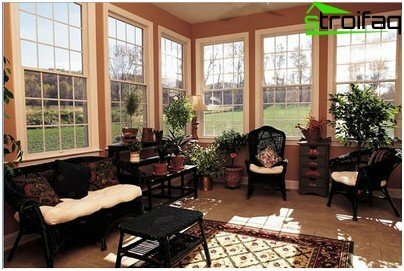 If you plan a one-story house, thebe sure to make a roomy loft and veranda. In the attic can be stored in the winter garden equipment and other important things. A summer terrace can serve as a dining room and even the kitchen. The two-storey buildings, equip kitchen on the first floor, and there was light to make large windows. Then there is a heated room where often set leading to the second floor staircase. 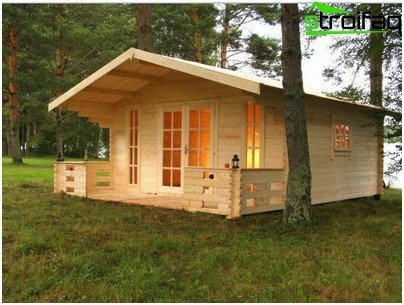 The holiday house have to beinsulated bedroom for cool spring and autumn season, and a guest bathroom. Summer's bedroom, billiard room and can be placed in the attic on the second floor. Also there you can arrange a place for growing seedlings of flowers and vegetables. Of course, all the distribution of rooms depends on your preferences. If you own imagination is not enough, to help build houses for garden photos that you come across on the right thoughts. Before planning a balcony, weigh all the "pros"and "against". After all, it can be called the most useless element of a country house. Of course, if from a balcony overlooking the mountains and waterfalls, it is needed. But if the landscape is limited outbuildings adjacent areas, such extension will bring nothing but trouble for you: Winter is to shovel snow, autumn wipe rainwater and sweeping up fallen leaves. It is better to build a garden house with a veranda from which it will be much more useful. The extension can be opened and closed. The second option is much more effective. The roof over the head of shielding from the rain, wind and sun. If you install windows with mosquito nets, then hot summer terrace can become a bedroom. When planning a basement under the house, in the firstand foremost, make sure that at this point there is no surface groundwater. They seep into the basement in the spring and cause an unpleasant smell in the house. Furthermore, this natural phenomenon can destroy the foundation, and is a more serious problem than the dampness. 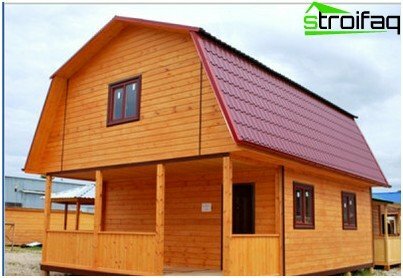 Construction of garden houses on their ownIt saves money from the family budget. The main thing - to have the necessary tools and materials. Their choice depends on what you are going to build a house: switchboard or square log. It should be noted that the second option is considered to be more durable and long-lasting: it is built is filled with a very strong and deep foundation. Garden houses shield being built in a very short period of time, because their skin is used for sheets of plywood. If you really try, you can get in three or four days. The first set of foundation support. The next step - the erection of the framework: the preparation of the upper and lower shell, the construction of trusses and vertical supports. Contours for doors and windows are formed by additional bars. cladding are mounted using screwsplywood frame. For the inner skin are more suitable plasterboard, particleboard or fiberboard. If you wish to warm the house, can be between the two layers of skin to lay mineral-cotton insulation. For the draft floor planks can be used, and for clean - linoleum or laminate. Rafters are sheathed with plywood, which was subsequentlycovered with roofing material or varnish. 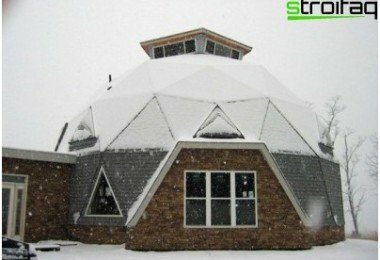 That house looked beautiful outer skin can be made from a solid material, such as lining or siding. Windows are set as wood, plastic and - depending on the preferences of the owner. But it is worth considering that the plastic last longer and need less care than the natural material. Garden houses made of beams, though slightly builtlonger shield, but look very aesthetically pleasing. To build them using a simple bar or profiled. Last in the assembly resembles a designer, because all the elements are connected by Paso-ridge system. Primarily poured foundation. 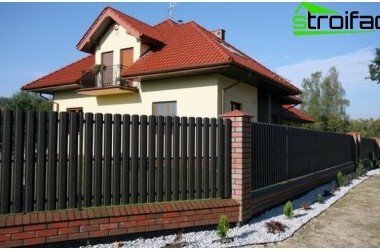 If the size of the house is not very big, you can do a columnar basis, if on the contrary - the tape. Concrete slabs often used for foundation, they are recessed into the soil approximately 20 cm. The finished framework is necessary to hide the waterproofing layer (for example, roofing material), then you can set the frame. Laghi and crown are placed on a foundation of support. Floor planks laid out, as in the previous embodiment. After installing the floor going to the wall of the timber. To attach connections ideal nageli. Each layer is necessary to shift the timber seal, hemp or jute, and only then to lay out a new crown. After the erection of the walls settling roof trusses and bracing set of beams. The final stage will cover a floor insulation. Then you can proceed to the installation of windows and doors. garden house interior is entirely dependent on its owners and their fantasies. Cottage - a place to relax. And how you want your own corner - you decide.